We have a brand new look at next year's Hellboy reboot. There are a great many people out there who will always be upset that this isn't Guillermo del Toro's long-discussed but never made Hellboy 3. Instead, we're getting a reboot from Lionsgate and director Neil Marshall (The Descent). Now, we have a new image that showcases David Harbour (Stranger Things) as the titular character in what will be an R-rated, gory take on the comic book series. The image features an absolutely jacked Hellboy charging down a hallway. He doesn't look that dissimilar to the Ron Perlman version, as both appear to be quite faithful to what creator Mike Mignola has presented us within the pages of his comics for more than 20 years. David Harbour's version does seem to have a certain grit to him, though. The image doesn't give us much else to chew on, but director Neil Marshall promises that this is going to be a much more violent movie than what Guillermo del Toro presented us with. Here's what he had to say about it. "It was always a case of, 'When in doubt, go back to the source material.' Some of the stuff is pretty sick. More violent and more bloody. We weren't making it with handcuffs on." Deadpool helped to open the door for other studios to try their hand at R-rated comic book movies, proving that going for the adult audience doesn't have to hinder a movie at the box office. It's all about delivering on the quality. The prior two Hellboy movies focused on the more fantastical elements of the comics. In this case, it sounds like they're going to lean heavily on Neil Marshall's strengths as a director, which means buckets of blood, carnage and, with any luck, very cool monsters. In the decade since Hellboy II: The Golden Army was released, comic book movies have truly cemented their status as more than a passing fad, largely thanks to the Marvel Cinematic Universe and movies like The Dark Knight. In that way, del Toro's ambitious sequel was tragically ahead of its time. In the case of this reboot, if they can deliver in the quality department, the timing could wind up being perfect and Lionsgate could have a gigantic franchise on their hands. It all comes down to execution. The cast also includes Ian McShane (John Wick: Chapter 2), Sasha Lane (American Honey) and Daniel Dae Kim (Lost), with Resident Evil franchise star Milla Jovovich on board to play the villainous Blood Queen. 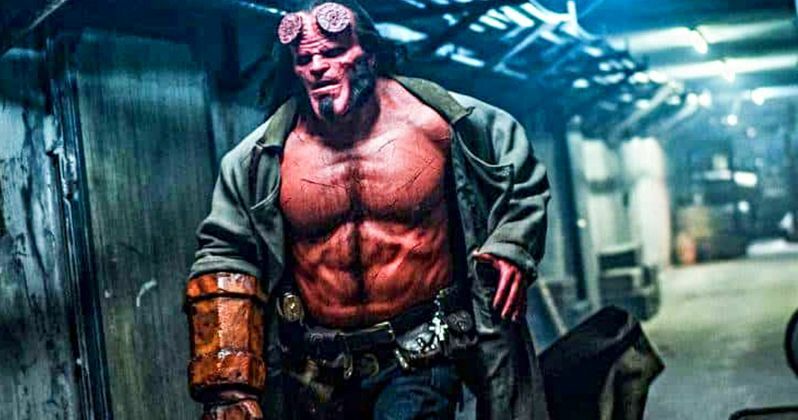 Hellboy is set to arrive in theaters on April 12, 2019, after having its release date delayed by several months recently. Dark Horse Comics also recently announced the first annual Hellboy Day in March of next year, just ahead of the movie's release to honor the character's 25th anniversary. Be sure to check out the new image of David Harbour's mega-ripped and pissed off Hellboy from Empire below.